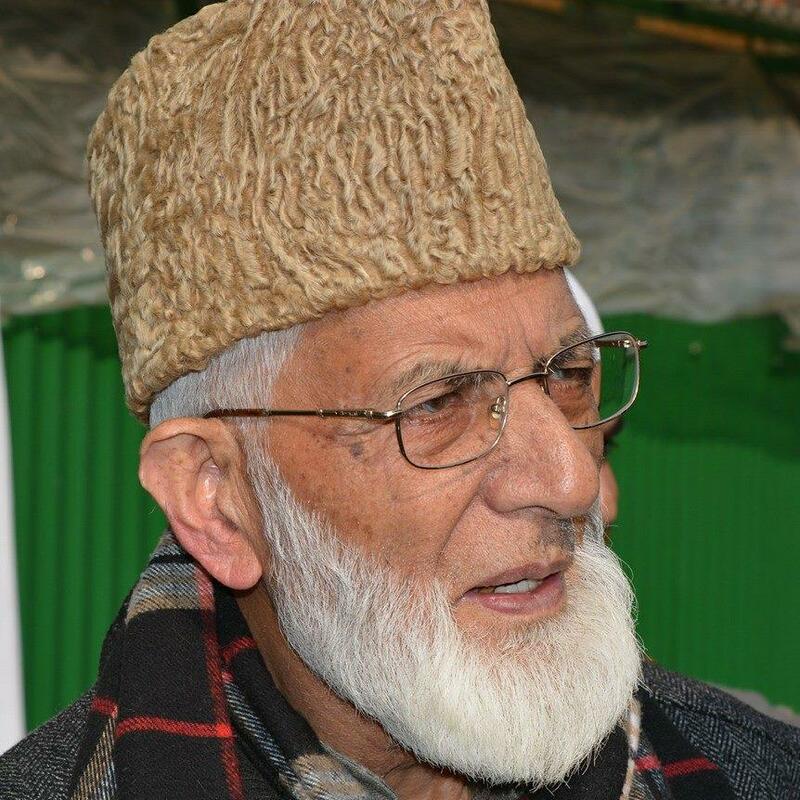 Syed Ali Shah Geelani, Chairman of the All Parties Hurriyat Conference, Srinagar, Kashmir has launched a campaign calling on Indian soldiers deployed in the region to “Quit Kashmir”. The region has been under what locals term “Indian occupation” suffering many human rights abuses, detentions, enforced disappearances, rapes, torture, injuries and unlawful killings since British India was partitioned into India and Pakistan as part of the independence process in 1947. Indian Occupied Kashmir has experienced the worst violence in recent years following the killing of Burhan Wani (22) commander of Kashmir’s largest pro-independence militant group Hizbul Mujahideen (HM) on July 8th in a gun battle with Indian government forces. Two other separatists died also during the military operation following a day long curfew in Srinagar. Thousands attended his funeral, hailing him a martyr and calling for “azadi” freedom for Kashmir. In neighbouring Pakistan, Dawn media reported that Sataz Aziz, Adviser to Prime Minister on Foreign Affairs Sartaj Aziz briefed the ambassadors of permanent members of the United Nations Security Council (UNSC) and the European Union on Friday regarding the ongoing conflict in Kashmir. He “deplored the lethal use of force by the Indian occupation forces against innocent Kashmiri people” highlighting that “oppressive measures by India cannot deter the valiant people of Jammu and Kashmir from their just struggle for their right of self determination”. 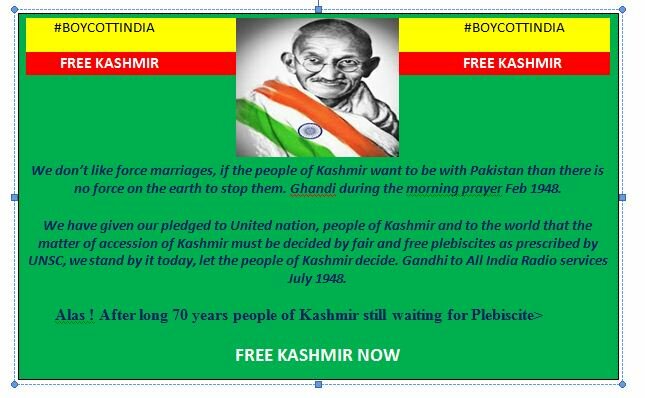 Free Kashmir posted the following on social media today reminding that decades later the people were still waiting for the plebiscite which had never happened as pledged. 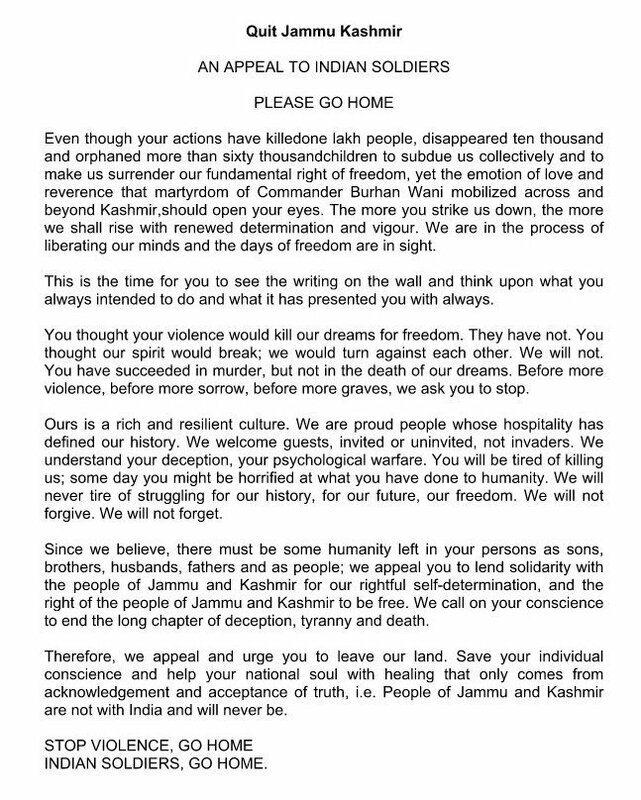 The people of Kashmir wish to decide their own future.